Too often, experts on climate change, environmental depletion, and species loss go out of their way not to discuss population’s relevance to their concerns. Like aid workers and others, scientists need to speak out on the urgency of curbing overpopulation. How can we make the dilemma of human overpopulation easier to grasp? Imagine seven billion wolves. . . . Continual growth is not sustainable. Can we change the public mind-set in time? Humanity vs. Nature—Winner Take All! Humanity’s extraordinary nonrenewable natural resource–enabled industrial lifestyle paradigm is an unsustainable one-time “blip” in our species’ history that must and will come to an end—soon. Four perspectives on the population crisis: The challenges are vast, but there is hope. Population growth is now exacerbating nearly every environmental problem in the U.S., and tends to erase any gains made from conservation and technological advances. Achieving a stable, and eventually shrinking, U.S. population will require a radical overhaul of immigration policies. Today’s myriad ecological crises can never be solved without a major commitment not just to control but to reduce human numbers. For the critical thinkers of Bangladesh, Avijit Roy will stand as a very special hero. Join Us in a Demand for Justice! A widowed victim’s cry for justice. Countries such as Saudi Arabia hide behind a Declaration of Human Rights in Islam, which isn’t about human rights at all. Atheists don’t live up to the myth about their being angry. Rather they get blamed for the anger that even gentle atheist commentary stirs in some believers. Christian writer C. S. Lewis is not right; he is just much better than you are at inventing literary comparisons. America is riding the secular wave that previously swept Europe, Canada, Japan, Australia, and other advanced democracies. Calling all freethinkers to honor Robert Ingersoll on his birthday, August 11. 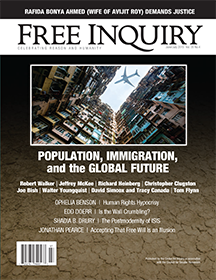 Since 2014, Free Inquiry has carried full-page advertisements presenting hard-hitting messages challenging religious belief and promoting the secular humanist outlook. Free will makes no sense, and growing numbers are concluding that it can’t be true. Is society ready for that? Growing up without fundamentalism equipped this Texan to resist its dubious appeals. A review of Headscarves and Hymens: Why the Middle East Needs a Sexual Revolution, by Mona Eltahawy. A review of Inventing a Christian America: The Myth of the Religious Founding, by Steven K. Green. A review of How God Works: A Logical Inquiry on Faith, by Marshall Brain.